Climate changes have already resulted in an increased number of flood events also in parts of the world where the annual precipitation has decrease. Hence, the natural vegetation of wetlands becomes flooded on a stochastic basis and the plants have to cope with the flooded - or perish. Also dryland vegetation, including many of our important crops, may become flooded with severe consequences for natural ecosystems and crops yields. Plants have evolved traits conferring flood tolerance and the aim of the project is to work with these traits in order to better understand how natural wetland plants respond to flooding. This research may lead to breeding of crops such as rice, wheat and barley that are better suited to a modern climate. See the list of publications for articles on this exciting topic! Contact Ole Pedersen for more information. This is a hypothetical response of root respiration to increasing concentrations of phytotoxins. 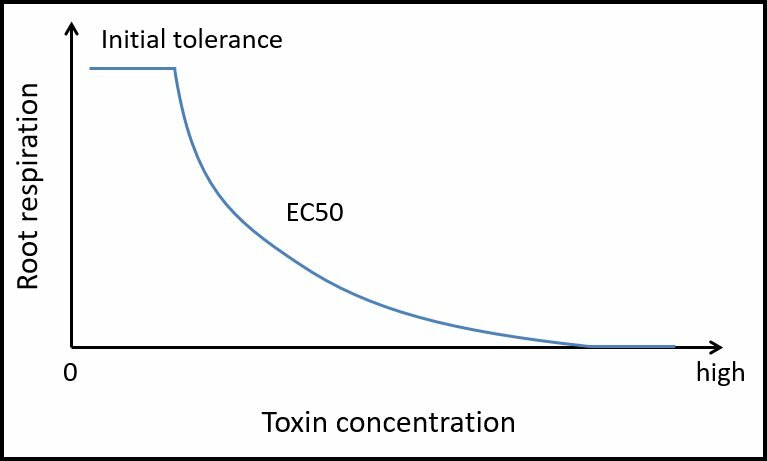 Initially, root respiration remains unaffected by increasing toxin concentration until a point is reach where the respiration declines exponentially. The point where root respiration has declined by 50% is called EC50. A modern genotype of wheat has been exposed to toxic concentrations of organic acids, which are produced in waterlogged soils by anaerobic bacteria. The growth effect is obvious! In this study, the plants exposed to organic acids did not die but they were adversely affected during treatment. This plant has been exposed to reduced iron (Fe(II)) which can reach toxic concentration in many waterlogged soils. The roots that were present during treatment with Fe(II) appear rusty whereas new roots produced during the recovery period are nice and white.